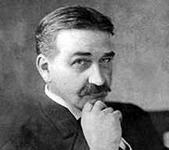 Besides the classic Oz books, L. Frank Baum wrote many other books and short stories under several pseudonyms. You can download OZ audiobooks for free at Librivox because they’re in the public domain. The Wizard of Oz — (1900-1920) Ages 9-12. 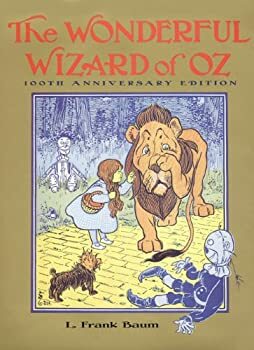 Publisher: One of the true classics of American literature, The Wonderful Wizard of Oz has stirred the imagination of young and old alike for over four generations. Originally published in 1900, it was the first truly American fairy tale, as Baum crafted a wonderful out of such familiar items as a cornfield scarecrow, a mechanical woodman, and a humbug wizard who used old-fashioned hokum to express that universal theme, “There’s no place like home.” Follow the adventures of young Dorothy Gale and her dog, Toto, as their Kansas house is swept away by a cyclone and they find themselves in a strange land called Oz. Here she meets the Munchkins and joins the Scarecrow, Tin Woodman, and the Cowardly Lion on an unforgettable journey to the Emerald City, where lives the all-powered Wizard of Oz. The Marvelous Land of Oz is the first of L. Frank Baum’s fourteen sequels to his much more famous novel, The Wonderful Wizard of Oz. Each of the sequels, which were published form 1904 to 1920, are illustrated by John R. Neill and are now in the public domain. 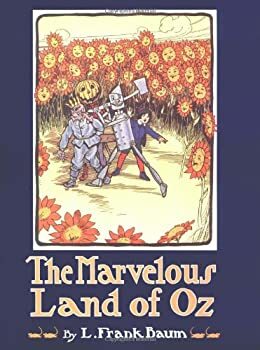 My 11 year old daughter and I listened to a delightful audio version of The Marvelous Land of Oz which was read by Tara Sands. I purchased this version for free at Amazon and added Tara Sands’ wonderful narration for $2.99 with the Amazon/Audible Whispersync deal. 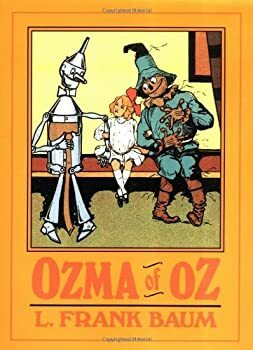 Ozma of Oz is the third book in L. Frank Baum’s OZ series. We all know what happened in the first book, The Wonderful Wizard of Oz. 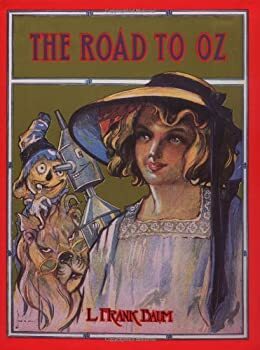 In the second book, The Marvelous Land of Oz, a boy named Tip accompanied several strange characters on a quest to help restore Princess Ozma to the throne of Oz. Dorothy, who was back in Kansas, didn’t appear in The Marvelous Land of Oz. If you happen to know Dorothy Gale, let me advise you to stay away from her. The girl attracts natural disasters like she’s some sort of magnet. This time, it’s an earthquake. Dorothy and her cousin Zeb are traveling on a wagon in California when it strikes. Down they go into a big crack in the earth and keep falling until they land in a city made of glass buildings. There are several clues that they have entered a fairy realm: Zeb’s horse (Jim) and Dorothy’s kitten (Eureka) can suddenly talk, the Wonderful Wizard of Oz (who was also in California) shows up with nine tiny piglets in his pocket, and the inhabitants of the city turn out to be made of vegetable matter. Dorothy and her friends can’t get out of the earth the way they came, so they decide to try to walk to Oz where they know they’ll be welcome. 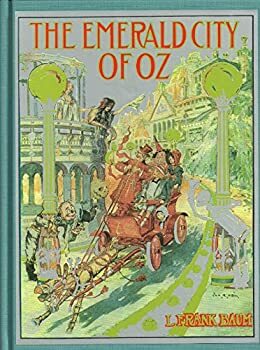 The Emerald City of Oz is L. Frank Baum’s sixth OZ book. Here we find Dorothy Gale back at home in Kansas. Uncle Henry and Aunt Em are about to lose their farm and they despair of what will happen to their niece Dorothy since they can no longer support her. The three decide that Dorothy should go live in Oz with her friend Princess Ozma who has often tried to get Dorothy to move there. 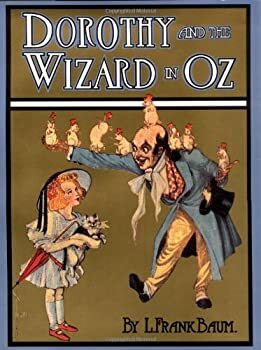 But sweet little Dorothy can’t leave Uncle Henry and Aunt Em living lives of hard labor back in Kansas, so she gets permission to bring them to Oz, too. It's no use; no use at all. The children won't let me stop telling tales of the Land of Oz. I know lots of other stories, and I hope to tell them, some time or another; but just now my loving tyrants won't allow me. They cry: "Oz — Oz! more about Oz, Mr. Baum!" and what can I do but obey their commands? I think it’s sweet that Baum wanted to satisfy his readers, but these stories are starting to feel like they were quickly and thoughtlessly thrown together just to satisfy those loving tyrants. The Master Key: An Electrical Fairy Tale — (1902) Ages 9-12. Publisher: A young boy accidentally summons the Demon of Electricity who gives him certain electrical gifts to show the world. The Life and Adventures of Santa Claus — (1902) Ages 9-12. Publisher: Taking the beloved symbol of merriment out of his conventional trappings and into the world of imaginative folklore, Baum gives Santa Claus an exciting life. After growing up in an enchanted forest with elves and wood nymphs, evil Awgwas, and the master woodsman Ak, Claus makes his first toy, ventures out on Christmas Eve, chooses his reindeer, and starts climbing down chimneys. The Enchanted Island of Yew — (1903) Publisher: Once there was an enchanted island in the middle of the sea. It was called the Isle of Yew. And in it were five important kingdoms ruled by men, and many woodland dells and forest glades and pleasant meadows and grim mountains inhabited by fairies. From the fairies some of the men had learned wonderful secrets, and had become magicians and sorcerers, with powers so great that the entire island was reputed to be one of enchantments. Who these men were the common people did not always know; for while some were kings and rulers, others lived quietly hidden away in forests or mountains, and seldom or never showed themselves. Indeed, there were not so many of these magicians as people thought, only it was so hard to tell them from common folk that every stranger was regarded with a certain amount of curiosity and fear. Queen Zixi of Ix: or The Story of the Magic Cloak — (1905) Publisher: The fairies assembled one moonlit night in a pretty clearing of the ancient forest of Burzee. The clearing was in the form of a circle, and all around stood giant oak and fir trees, while in the center the grass grew green and soft as velvet. If any mortal had ever penetrated so far into the great forest and could have looked upon the fairy circle by daylight, he might perhaps have seen a tiny path worn in the grass by the feet of the dancing elves. The Last Egyptian: A Romance of the Nile — (1908) Publisher: This was the only adventure novel (set in contemporary Egypt with some fantasy trappings) and the last adult work of fiction of L. Frank Baum, creator of the Wizard of Oz, published eleven years after he wrote Mother Goose in Prose which first introduced a little girl by the name of Dorothy. The Sea Fairies — (1911) Ages 9-12. Publisher: Trot and her uncle, Cap’n Bill, encounter unusual experiences with mermaids, sea-serpents, and other strange creatures while journeying in the depths of the sea. Enchanting fantasy by creator of beloved “Oz” stories whisks young readers away on an exciting underwater adventure! They’ll meet a school of beguiling mermaids and an aristocratic codfish, attend an elegant banquet, confront an awesome sea monster, and much more. Enhanced by 78 of John R. Neill’s original black-and-white illustrations. Sky Island — (1912) Ages 9-12. Publisher: Captivating tale by a master of make-believe recounts the further adventures of a little girl named Trot; Cap’n Bill; and their new friend, Button-Bright. Transported by magic umbrella to an island in the sky, they meet six snub-nosed princesses, discover the King’s treasure chamber, and meet Tourmaline the poverty Queen. 86 black-and-white and12 full-color illustrations. Jaglon and the Tiger Fairies — (1953) Publisher: An animal fairie tale. The Surprising Adventures of the Magical Monarch of Mo and His People — (1968) Ages 9-12. Publisher: Adventures in a land even stranger than Oz. A good many years ago the Magical Monarch of Mo became annoyed by the Purple Dragon, which came down from the mountains and ate up a patch of his best chocolate caramels just as they were getting ripe. So the King went out to the sword tree and picked a long, sharp sword and tied it to his belt and went away to the mountains to fight the Purple Dragon.